To support our friends exhibiting at the Hartford Fishing Show this weekend, I'm Gonna Miss Her (The Fishin' Song) by Brad Paisley is our Sea Song of the Week. Time for our weekly roundup of boating events around the world, starting with the Northeast Fishing and Hunting Show in Hartford. 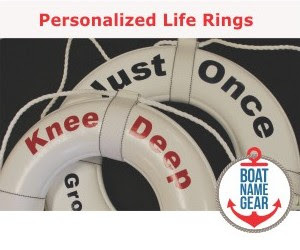 You should be there because WE'LL be there – look for the BoatNameGear exhibit (booth 249) and buy a shirt with your favorite fish stitched on it. The show is featuring that crazy Boston fishing guy, Charlie Moore, on Saturday. Several other fishing experts will be on hand all weekend to share their secrets. Oh, and if you go Friday you'll not only avoid the crowds, but you can save a "buck" on admission by following this link for a coupon. (Get it? We said "buck" because it's a hunting show. ha ha.) There will be a variety of sport and fishing boats on hand, and great deals on charters and fishing trips, as well as gear for both hunters and fishermen and women. Other new boat shows this weekend include two events with names that make them sound bigger than they probably are. First is the Savannah International Boat Show. Savannah is one of our favorite towns, but is it really going to be an International show? Next is a show in Springfield, Illinois, which is calling itself "The Boat Show". Sounds like a pretty big event for a state that's landlocked! But you know what they say... A bad day spent at even a small boat or fishing show is better than a good day spent at work. As always, there's more info about these and other events for outdoors-men and women on our boat show calendar. After two years of development, MarineFuel.com is announcing the availability of their unique marine industry portal, just in time for the 2010 Miami Boat Show. Among the site's services are two tools you can use to save money on, you guessed it, marine fuel. First, for the recreational or commercial boater, there is the FuelDockPrices service, which allows you to enter an address online and find all the current fuel prices on marine gasoline and diesel within a selected radius. A quick search of fuel prices in Miami, for example, showed a range of prices from $3.16 to $4.45. With that much disparity, it's easy to see how even a small deck boat or express cruiser could save hundreds of dollars or more over the course of a boating season. Next, FuelBidDesk allows members to access wholesale prices when purchasing at least 1,000 gallons of marine fuel. This service is helpful for any large boat, organization or even a gathering where a large quantity of fuel is needed. Obvious examples include marinas and yacht clubs. But this service offers opportunities for savings to less obvious groups as well, including organizers of fishing tournaments, charter fleets, tug boat owners and even boat clubs. Access to the FuelDockPrices search tool is free for now, and the FuelBidDesk system is available for what looks like a nominal fee compared to the savings one can enjoy with access to the club. Given the current state of the economy and the opportunity for savings, why wouldn’t every boater use these tools? Otherwise, this weekend's boat show schedule is light with most industry folks looking to avoid the disappointment of low turnout to their events on Superbowl Sunday. The industry is also gearing up for the big one in Miami next week. That being said, if you are in Atlantic City, Tulsa, Seattle or Fort Wayne, Indiana, there's a boat show near you going on right now. Did you go to the Hartford Boat Show last weekend? BoatNameGear was there, and we were pleasantly surprised with the turnout – especially on Saturday morning and afternoon. Lots of folks came by the booth to look for boat name ideas or gear for a recently purchased boat. That's right, many people told us they recently bought a boat - we heard the same thing from the dealers. In fact, one of the largest boat dealers in Southern New England told us they sold 20 boats at the show. Not bad for a town like Hartford in January, especially in this economy. If you attended the New York show a couple weeks back (or even if you didn't but thought about going), the National Marine Manufacturers Association wants to hear from you and have put out this survey to get your feedback on the show. 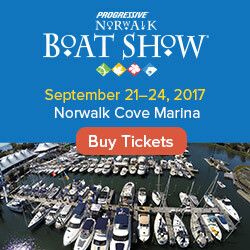 More information about all these shows and more, as always, can be found on our boat show calendar.